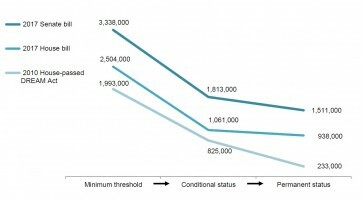 Are Recent Immigration Policy Changes at Odds? Immigration remains a hotly contested policy area six months into the Trump administration. This article reviews two recent policy developments that may impact immigrants and public administrators. In past weeks, the healthcare and White House reshuffle dramas largely drowned out word of several interesting immigration policy developments on Deferred Action for Childhood Arrivals (DACA) and temporary worker visas that likely interest immigrants and public administrators. The developments also provide a reminder that predicting support or opposition for a given immigration policy cannot simply be mapped onto the classic conservative/liberal spectrum. 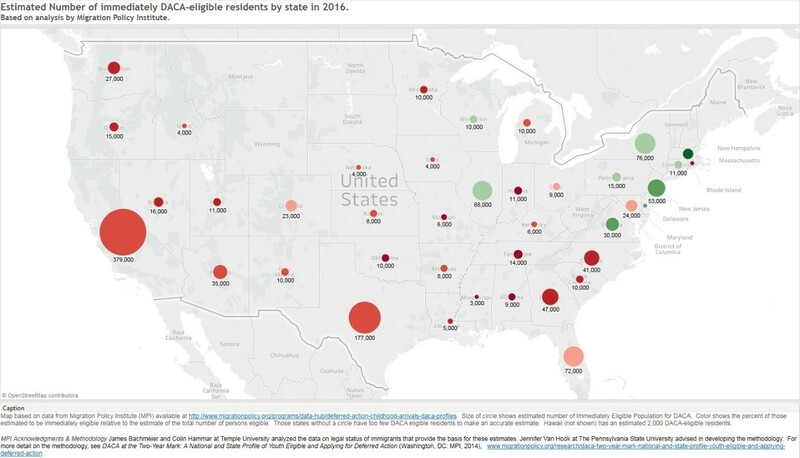 For DACA recipients, their families and local administrators in their communities (see the map below here for estimates of DACA eligible populations by state), discontinuing DACA without the passage of legislation to provide recipients with more permanent status would potentially result in a large number of heart-wrenching deportations. 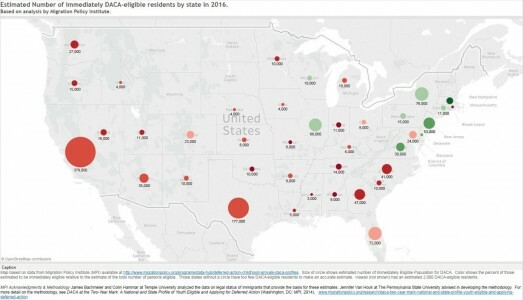 The Migration Policy Institute (MPI), which provides regular updates on estimates of DACA eligible individuals, also released a 15 page comparison of the 2017 House and Senate versions of the Dream Act, including how they match up to the 2010 version. 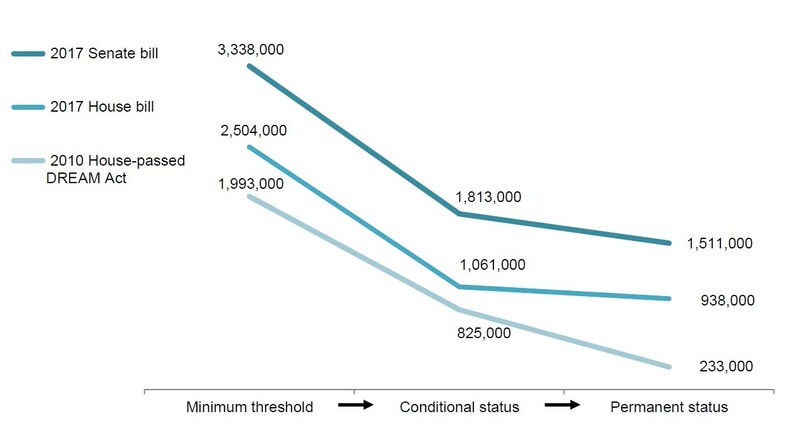 As can be seen by the chart (developed by MPI in their report) the current Senate version would provide a path to permanent legal status to an estimated 600,000 more persons than the House version. Despite the bi-partisan sponsorship of Dreamer legislation, intense opposition to DACA from significant parts of Trump’s electoral coalition makes the prospects of passage unlikely. (A recent Breitbart News article is one example of the case made against DACA—albeit with major factual errors—DACA recipients cannot obtain a green card.) But the path of these new Dream Acts through Congress bears watching. 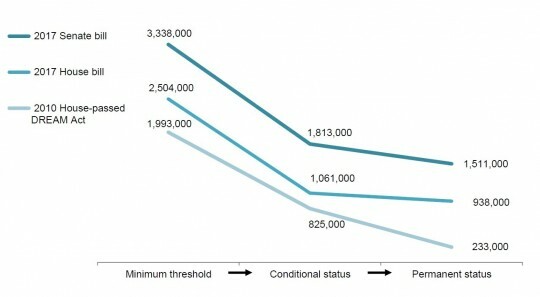 Many news outlets covered a seeming anomaly during the Trump administration’s “Made in America week.” Despite the Trump reputation for seeking ways to keep additional immigrants out of the United States, DHS announced the expansion of the annual limit on H-2B visas (up to 15,000 additional), which are for temporary non-agricultural workers. Many tourist attractions use H-2B visas to hire non-U.S. seasonal workers. In contrast to the DACA issue, Senator Durbin joined colleague Chuck Grassley (R – IA) in criticizing the expansion. Meanwhile, conservative Sen. Thom Tillis (R-NC), who had advocated for expansion of the H-2B visa category, celebrated the decision and released a hold on the confirmation of Trump’s nominee to head US Citizenship and Immigration Services. Are these two immigration policies at cross-purposes? What at first seems out of character for the Trump administration is less confusing if we remember immigration has rarely fit neatly into the dominant liberal-conservative categories which drive many political debates. 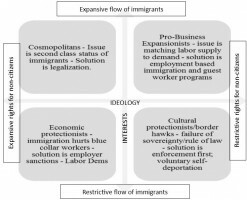 Daniel Tichenor, in his 2002 book Dividing Lines, argued immigration policy coalitions often break into four broad categories created by two different spectrums. One spectrum deals with the debate over the number of immigrants admitted (often with a focus on permanent immigrants) while the second spectrum deals with what rights immigrants should have while in the United States. 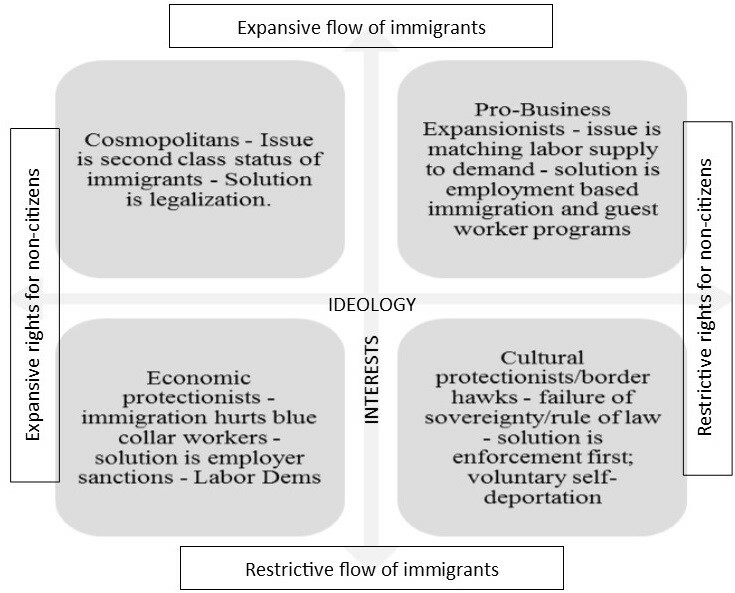 Figure 3: Four broad immigration policy coalitions – based on Tichenor’s 2002 book Dividing lines: The politics of immigration control in America. To oversimplify Tichenor’s insights in the interests of space, Trump as a self-trumpeted businessman, and numerous conservatives who often advocate for business-friendly tax policy, may be coherent in supporting more temporary immigrants (where society takes on no long-term responsibility to the workers) while opposing legalization of some undocumented immigrants and placing them on a path toward more expansive rights enjoyed by permanent residents and citizens. Sen. Durbin, by contrast, may be coherent in advocating greater rights for Dreamers and the resulting expansion in the number of permanent immigrants while opposing expansion of temporary workers since such visas limit the rights of the holder to change jobs, potentially exposing the temporary worker to abuse by unscrupulous employers. 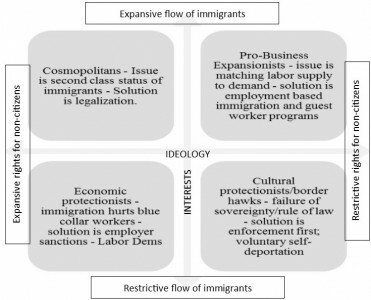 As the Trump era continues, one of the key questions we might ask using Tichenor’s model is whether Trump’s immigration policies will try to appeal most to pro-business expansionists, economic protectionists or cultural protectionists. Author: Grant Rissler successfully defended his dissertation in Public Policy and Administration in June at the L. Douglas Wilder School of Government and Public Affairs, Virginia Commonwealth University (VCU). A former immigration paralegal, his current research focus is local government responsiveness to immigrants. He also serves as Asst. Director for Programs for the Commonwealth Educational Policy Institute at VCU. Grant can be reached at [email protected].